We are a renowned manufacturer, supplier and exporter of an unmatched array of Rainbow Sheets. These sheets have a huge demand in the marketplace for their reliable quality, longer service period and high-strength. Color of these sheets remain intact even after a long period of time. 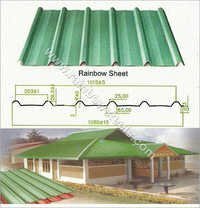 Our offered Rainbow Colour Steel Sheet are light weight, thus easy to configure and dismantle. We offer our products according to the design or requirements communicated by our clients. Excellent design and dimensional accuracy of our Rainbow Sheets provide high-utility in various application areas. Their resistance to fire, water, weather, etc., increases life and helps in retaining smooth finish and elegant appearance.